If you have problems viewing this right click on the link and save the target to your computer. Then double click the saved file. FREE Deception Dollars with every order! 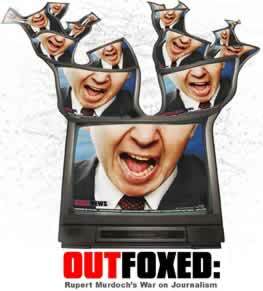 "Outfoxed" examines how media empires, led by Rupert Murdoch's Fox News, have been running a "race to the bottom" in television news. This film provides an in-depth look at Fox News and the dangers of ever-enlarging corporations taking control of the public's right to know. The film explores Murdoch's burgeoning kingdom and the impact on society when a broad swath of media is controlled by one person. This documentary also reveals the secrets of Former Fox news producers, reporters, bookers and writers who expose what it's like to work for Fox News. These former Fox employees talk about how they were forced to push a "right-wing" point of view or risk their jobs. Some have even chosen to remain anonymous in order to protect their current livelihoods. As one employee said "There's no sense of integrity as far as having a line that can't be crossed." Sean Hannity - The bully. A documentary about the Arab television network Al-Jazeera's coverage of the U.S.-led Iraqi war.